Annually there are over 1.8 billion transits and stopover flights that are more cost-efficient than long-haul direct flights. So instead of avoiding the extra hours, why not enjoy a longer stop and have two holidays instead of one? Travellers can explore a new location and stay at one of these select hotels before taking their next flight. From stretching your legs riding a bike in Amsterdam to a rejuvenating jetlag therapy treatment in Bangkok, here are our picks of the best stopover destinations. Why go: Let this stunning hotel be the destination for a swift visit. Wind down with a glass of delicious seasonal wine and savoury amuse-style bites, finely selected by the executive chef Dennis Kuiper. Guests can also stretch their legs and explore the Dutch city on one of the hotel's private bikes. Rate: High Wine (available from 3 p.m. to 5 p.m.) includes four different wines and four bites for €39.50 (approx. £29) per person. Rooms from £366 per room/night including taxes, wi-fi and 24-hours room service. Why go: Guests can relax and restor in this stunningly renovated hotel after a long flight or even after a day of sightseeing, with Loews's special restoring package. 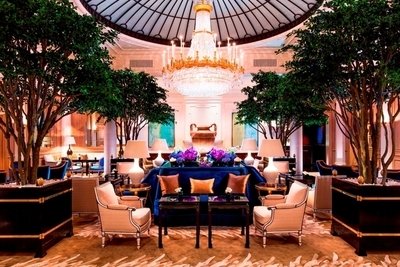 This includes two cocktails at The Regency Bar as well as a reviving spa session at Julian Farel's salon in midtown Manhattan. Why go: Let time fly in the beautiful city of Zurich with Baur Au Lac's delicious afternoon tea, and enjoy the historical atmosphere of the location through this culinary delight. Taste homemade scones, exquisite sandwiches and pastries in the hotel's Le Hall after a tranquil walk by the lake. Rate: Afternoon tea for 64CHF (approx.. £43) per person or 79CHF (approx.. £53) with Phillipponnat brut champagne from 1.30pm to 5.30pm (available until march 2016). 870CHF per room/night (approx. £591). Why go: To get the blood flowing again, Viceroy challenges flyers to board on the world's fastest roller-coaster at Ferrari World Abu Dhabi for an adventure-filled stop in the Arabian Gulf. The hotel's Family Plan package will treat families with a 50% discount on a connecting room for children when booking a deluxe suite. Rate: 'Family Plan' package, Room from AED 1,449 (approx. £265) per room/night. Why go: Forget the long hours and queues at the Louvre, Peninsula Paris has the perfect art-filled afternoon for guests to have a taste of the French Art de vivre on their short layover. The hotel's Concierge has carefully selected a range of tickets for on-going exhibitions. Guests can choose from the Picasso Mania, Yves Saint-Laurent or Vivre pour l'Art, guaranteed to showyouthe best of the city of lights. Rate: From €1,000 per room/night (approx. £735), includes museum entrance, refreshments, transportation and breakfast for two. Why go: The Peninsula Bangkok understands that good sleep is vital when dealing with long flights and this package reflects that. It provides guests with an invaluable range of tools to maximise their sleep; including a jet lag eliminator massage, musical therapy, a health and wellness consultation, yoga, and even a tea workshop ceremony, promising guests a total sense of wellbeing before their onward journey. Rate: 'Sleeping Well' package 53,800TBH (approx. £988) for 3 nights' accommodation, including all sleep treatments and access to the fitness center and tennis court.